Are You Or Someone You Love Suffering From Bladder Control Problems? .Hi, my name is Laura McKaig and welcome to Laura McKaig Physical Therapy. In the next few minutes you are going to discover how men and women like you can regain control over their bladder and enjoy time with family, girls’ night out, or a dream vacation without fear of not knowing where the nearest bathroom is or fear of having an accident. At this point, you think that rushing to the bathroom or having embarrassing accidents is just something you have to live with…but secretly you hope that you can find a way to break free from that. It’s not fun having trouble with things that should be so simple and worry-free, like using the toilet. Just enter your first name, your email address and click the “Yes! I Want The Free Report” button below and you'll instantly receive the Free Report by email. You'll receive all the information that shows you why you really can ease your overactive or leaky without having to rely on medication or risky surgery that may or may not work. I work with men and women just like you to find relief from bladder control problems. What I can tell you is that medications, surgery, or just ignoring it are not likely to help. Why? Because they don’t get to the root of the problem. They just treat the symptoms, and you may have to take the medication the rest of your life to give you the results you are looking for. I know so many people who have just accepted that leakage or rushing to the bathroom is now a normal part of their lives. This does NOT have to be you! 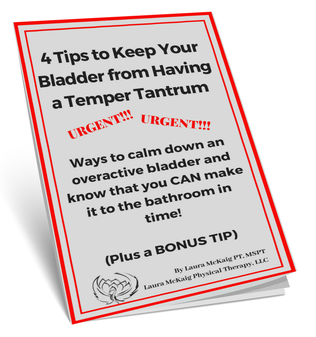 My free Report will explain why you should have hope that you can live free from being controlled by your bladder. This Report is not for you if you're content to live with taking medication or wearing Depends, don't care about fixing the main problem, or just want a quick fix to your problem. What would your life look like in a few months if you were free from bladder leakage or the panic that comes when the urge hits? So go ahead... enter your first name, your email address and click “Yes! I Want My Free Report” button to instantly receive the Free Report by email. There’s no catch…I’m doing this because I truly want to help you find the answers you are looking for to solve these problems. I love giving people the knowledge and skills they need to improve their quality of life. All you have to do is enter your information and I’ll send it to you immediately. Which Costly Mistakes Are You Going To Make Trying To Fix Your Bladder Leakage? Is Your Bladder Problem Urgent?